I figure it’s a Chicago game New Year’s Eve. I’d cut into my 14-oz dry aged strip and it was definitely not rare. It’s my first time at The Capital Grille. Nobody knows me. I’ll just send my steak back. Jim likes a filet on the bone -- lean and flavorful -- with scallops tonight as a special. I summon our server, Valerie (it’s written on her label). Valerie stands her ground as I show her the beige pale pinkness of my first cut from the fatty edge. “My boss always says to me if someone complains about the cooking, have them cut through the middle,” she recites. I oblige. In the bulky midriff of the two-inch thick sirloin it’s looking decidedly rare. No denying it. “Well, okay,” I say, helping myself to a couple of our shared truffled fries. “It’s rare.” And I slice myself a nice chunk from the steak’s middle-aged waist. Chicago's Capital Grille looks like an aristocratic private club with a mostly plebian clientele. 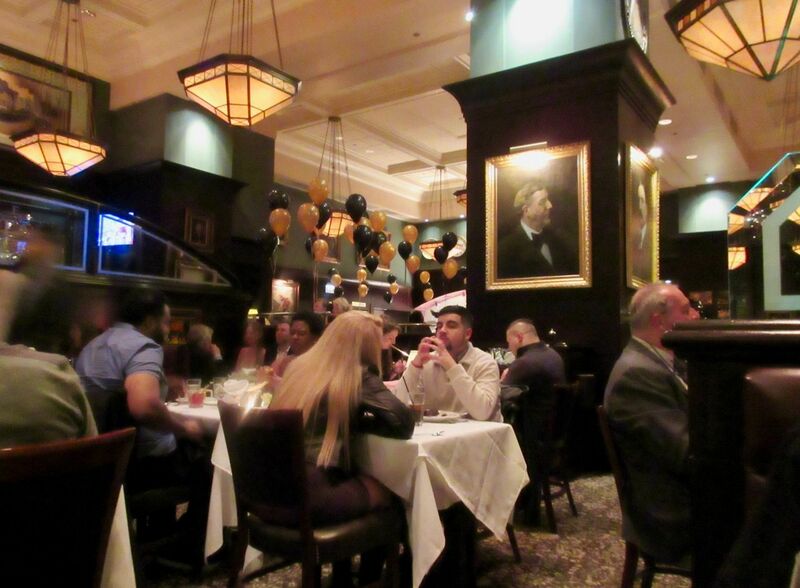 Chicago’s Capital Grille is black and gold and very handsome. It looks like a men’s club with portraits of distinguished members scattered about. There are wine lockers for regulars and swashbuckling steak knives for sale. I can’t say we early diners on New Year’s Eve look especially upper crust. Most of us are dressed to be home before the serious drinking gets dangerous. Capital Grille is a chain. We have one in Manhattan. I’ve not been since 2006. I can’t recall what I said. Brother Jim has chosen it for the last dinner of my holiday visit. My Chicago kin are starting small, saving space for the main event. Mary asks if she can have half a wedge salad. Valerie expects it won't be a problem. Jim is having a cup of New England chowder. Mary’s son Patrick wonders if he can get a cup of French onion soup rather than a bowl. 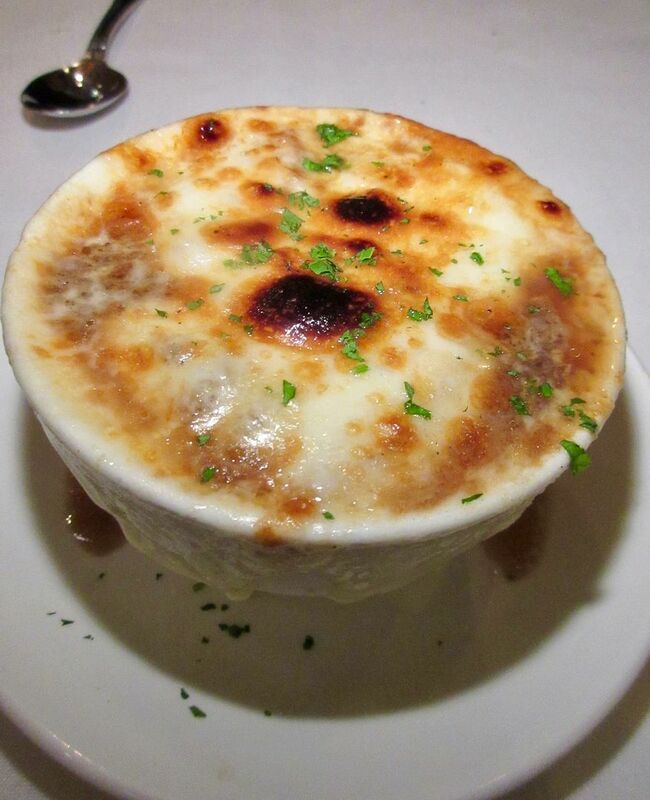 Mary's son Patrick asks for a cup of glazed onion soup. No Problem. “They probably can’t do that?” I speculate. But in Chicago, it seems, the customer is always right. Of course they can do a mini version. Sirloin is my usual first choice. 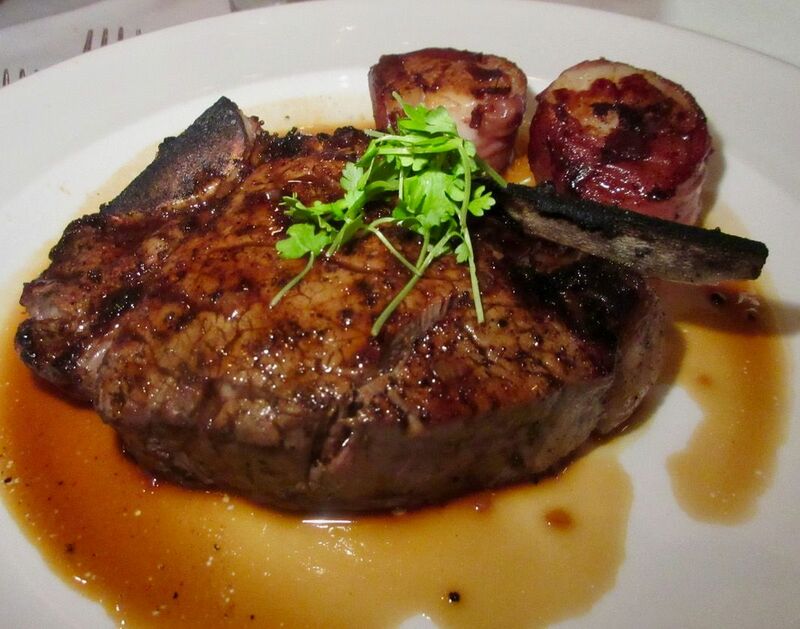 Tonight’s $46 dry aged 14-oz steak is rare enough, but limp on flavor. Brother Jim insists I taste his favorite cut, filet on the bone – a $64 special that evening delivered as surf ‘n’turf -- with a trio of giant scallops. The meat is less fatty, he notes, “And the bone gives it more flavor." My kin start small while I almost demolish this delicious Brussels sprouts salad with bacon. 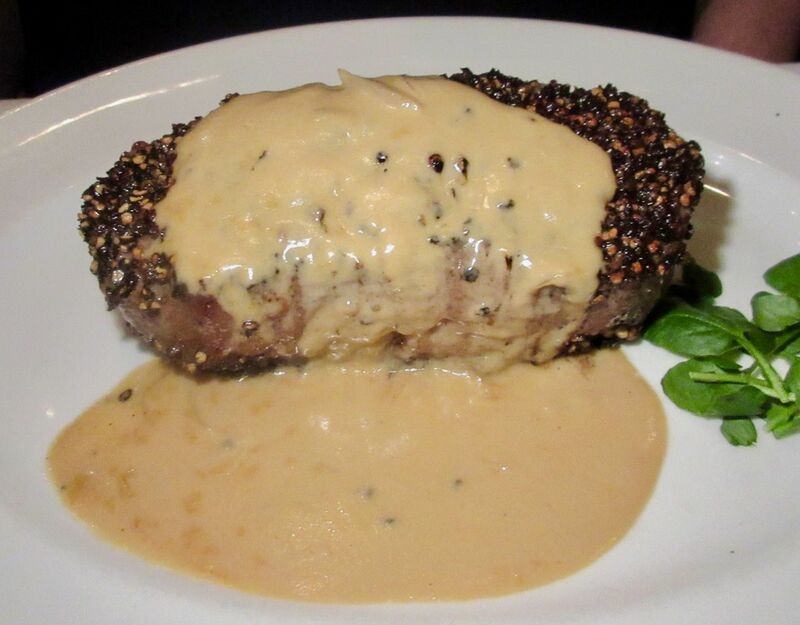 Mary’s son Patrick urges me to sample his $48 dry-aged strip au poivre with horseradish cream. It’s my cut with a peppery rub in an evening gown. Very savory. Mary is glowing as she passes me a chunk of her Porcini rubbed bone-in ribeye with 15 year Aged Balsamic. The little morsel slides into my mouth and melts. It’s shockingly tender. I’m guessing that’s the ribeye fat sliding along. Patrick shares tastes all around of his pepper steak with horseradish cream. I take another spoonful of creamed spinach and two more fries, getting cold fast alas. I am promising myself to always play a Chicago hand when I’m in Chicago. 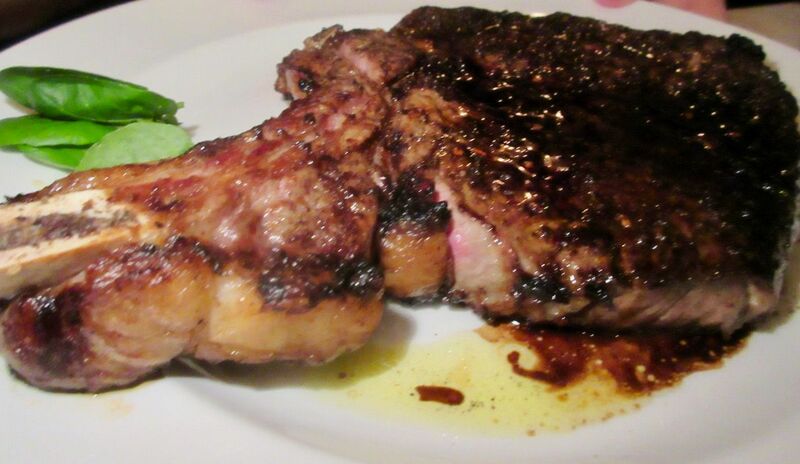 No need to go for a less fatty steak, especially on New Year’s Eve (resolutions, if any, are not due till next day). From now on, I’ll get my cow seared and rubbed. Sister-in-law Mary finds the porcini-rubbed ribeye the best steak she's ever eaten. Maybe it's the aged balsamic, she muses. 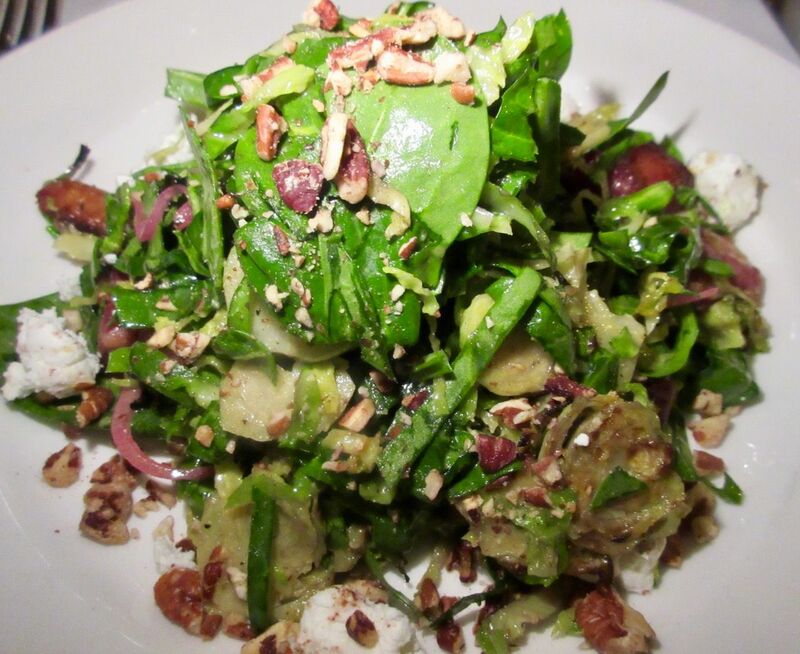 I’m filling up fast with all these handouts from Mary, Patrick and Jim, plus my salad starter, the savory haystack of shaved Brussels sprouts with toasted pecans, goat cheese and large nubbins of bacon that I almost finished. Most of my meat is left. I will it to Patrick since he a bachelor and needs to start the year right. Mary will take her more modest remnant home. “There’s nothing better than a steak bone for breakfast,” we agree. 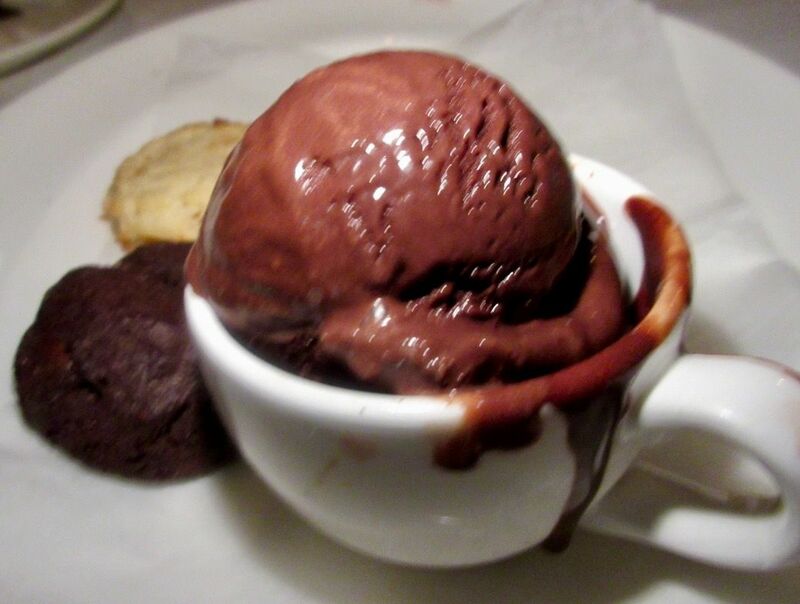 A trio of tea cups with intense chocolate ice cream and cookies are a dazzling finale to 2016. The $9 ice cream delivery is majestic. I’m so stunned and also busy getting a bit of flourless chocolate espresso cake that I miss the camera shot. Try to visualize. Three individual cups of very dark fudgey ice cream lined up in a row on an oval tray. The cookies alongside are not just perfunctory either, but real cookies, chocolate chocolate chip and vanilla almond dreams. The Capital Grille. 633 North St. Clair Street corner of East Ontario Street. 312 337 9400.